If you love off-roading, overlanding, and getting out into the wild, there is a pretty good chance you own a 4Runner. The 4Runner has long been one of the best alternatives to buying a Jeep Wrangler, and the 5th generation 4Runner is the best yet. Unfortunately, one thing has always plagued the 4Runner since its inception, and that’s a lack of power. In completely stock form the 4Runner isn’t terribly slow but definitely isn’t going to win any races. Once you add larger tires, bumpers, roof rack, etc., the 4Runner might as well be called a 4Walker. Luckily, we have a solution. Obviously, bolt-on modifications such as an intake and exhaust will help your 4Runner scoot down the road, as will re-gearing it to compensate for larger tires. With the added weight of bumpers, a winch, lights, roof rack, gear, etc., it’s still going to be underpowered. If you want to get the most out of your engine, you need to ditch the factory tune. Sure, Toyota does a decent job squeezing power out of the 4.0L, but they leave some performance on the table which can be exploited with a more refined tune. 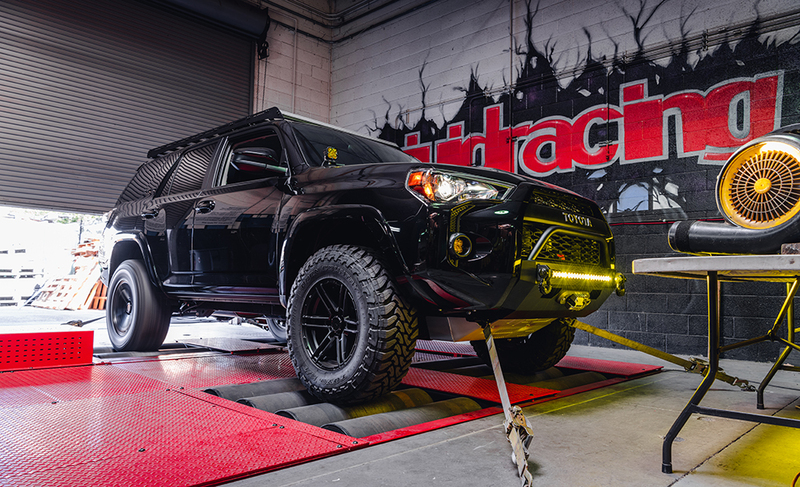 Our tuning division, VR Tuned, knew they could work wonders with the 4Runner as they have with the Tundra. For reference, we use an all-wheel-drive Mustang dynamometer which typically shows drivetrains loss of 15-15%. We also do our testing at the Vivid Racing headquarters in sunny Gilbert, Arizona, so ambient temperatures are pretty high during our testing. The 4Runner we used for testing was using larger 285/70/17 tires which made drivetrain loss even worse on top of the high ambient temperatures. 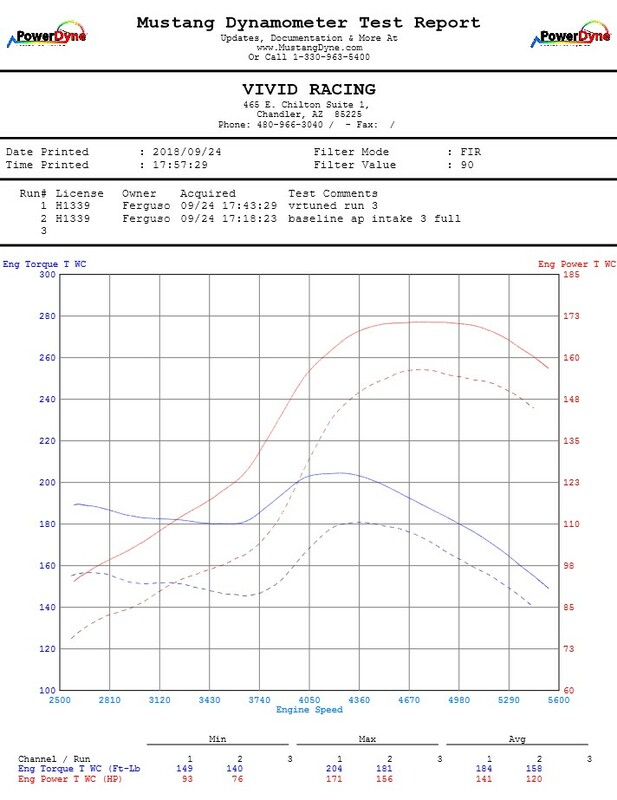 With the 4Runner strapped down to our dyno, we ran it in stock form and found 156whp and 181wtq. This equates to about a 35-40% drivetrain loss thanks to the larger tires. We flashed the ECU with our tune and ran the 4Runner again. Ambient temperatures were the same, and we gave the 4Runner time to cool off, so all variable were as controlled as possible. Once tuned, the 4Runner put down around 171whp and 204wtq. Of course, peak numbers only tell a small part of the story. Throughout the entire power-band, all the way up to redline, the 4Runner made more power than stock. On the low end, there are gains of around 40wtq, a massive increase for a naturally aspirated engine this size. The increase in low-end torque will make your 4Runner much easier to drive on the street, as you won’t have to push your foot to the floor as often. It will also make off-roading easier, as torque is what will help you crawl over obstacles nice and slow. The improved throttle response will also make your 4Runner much faster off the line. Since we know the drivetrain loss of the particular 4Runner we tested, we can calculate estimated crank horsepower gains, which is the number Toyota states to the public. A stock 4Runner outputs 270 horsepower and 278 lb-ft of torque. Once tuned, you can expect around 296 horsepower and 297 lb-ft of torque. If you were to add in an intake, exhaust, and quality fuel, you can expect around 315 horsepower and 319 lb-ft of torque! If you have any questions about the VR Tuned ECU Flash for Toyota 4Runner or would like to purchase parts for your car, please do not hesitate to contact us. We can be reached by phone at 1.480.966.3040 or via email at sales@vividracing.com.